Beautiful Staffordshire pin dish with the famous painting by C.E. Turner. Measuring 5″ across, this dish is made of fine bone china and is in near mint condition. Enhance your collection today with this beautiful display piece. 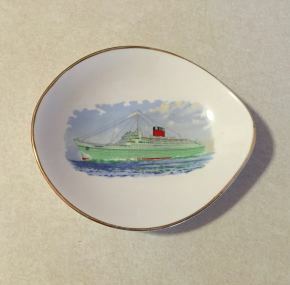 As you might expect, these are not as common for Caronia as they are for other Cunarders because of her lower passenger loads and longer voyages. Grab it!